The Open Water Course was great ? You've discovered that diving is for you and you want to continue? Then the Advanced Open Water is just the right choice. In the Advanced Open Water Course there is no more pool session and only little theory - you did all this in your Open Water already, so let’s learn something new! We do five different dives in this course – and each dive has a different topic. As an Open Water Diver the rules say, that you are allowed to go down to 18 meters depth. But what when a dive site is deeper? As an Advanced Open Water Diver you are allowed to go down up to 30 meters! And we are going to do this for the first time on the Advanced “Deep Dive”. The next dive is about navigation underwater. 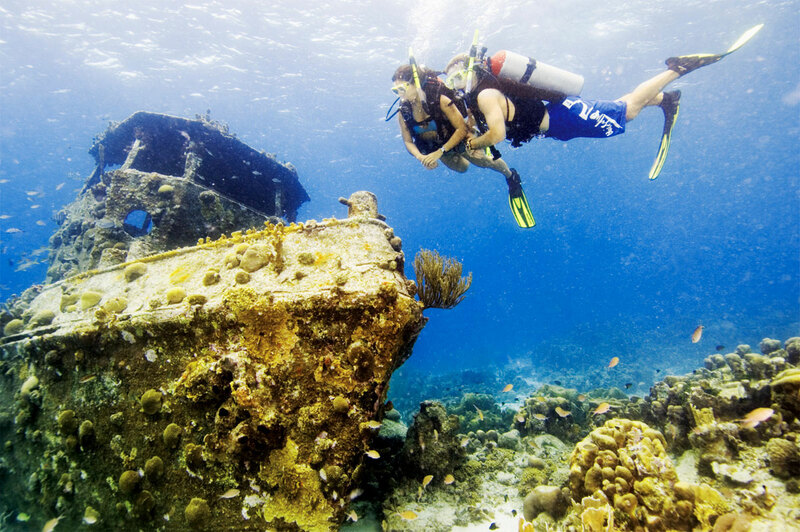 You've probably noticed that your instructor or divemaster can navigate and orientate under water easily. We will teach you this in the “Navigation Dive”. For example you will learn how to use a dive compass or a dive computer! A highlight in the Advanced Open Water Course is certainly the night dive. Here you go down into the water when it is dark obviously. You will receive powerful dive lights and explore the darkened sea! The great thing is that when it is dark other underwater creatures come out. So you can then maybe see hunting , large barracudas or big crabs. Everything that remains hidden from your eye during the daytime , comes out at night – and that’s super exciting and thrilling! It’s a complete different world – again. The next two dives are elective dives. Selected from more than ten different adventure dives. We recommend e.g. a wreck dive! This is one of the most popular dives in the Advanced Course . Here , near Koh Tao we have the HMTS Sattakut , an old U.S. Navy ship that was sunk off the coast and is now “opened” to divers . This dive is absolutley cool and exciting! Other selectable dives are for example a Nitrox Dive or the Digital Underwater Photography (if you do not own a underwater camera yourself, you can borrow one from us). We can also work on better buoyancy control if you like. Here we do exercises to work on this with you. After all, is a good buoyancy one of the most important skills of a good diver?